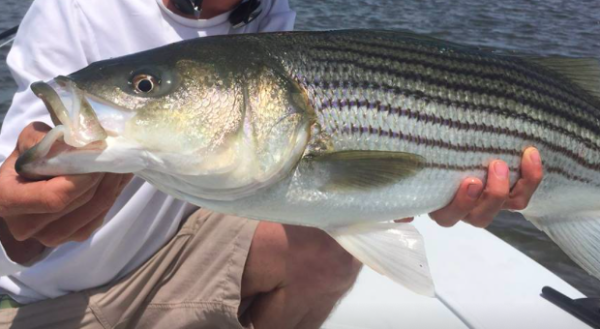 Striped bass are faring worse on the Bay than previously thought, according to a stock assessment that’s expected to be released soon. That means fishery managers will likely have to tamp down rockfish catch limits this year. But what, specifically, might those limit changes look like? 1) One trophy-sized fish 36-inches or longer for the year. 2) Requiring non-offset circle hooks for natural bait. 3) Maximum of three keepers per vessel. 4) Maximum of four keepers per vessel. 5) A one-fish possession limit December 10-31 (down from the current two-fish limit). 6) No Bay and coastal trophy seasons and a 28-inch Chesapeake Bay size limit through December 15. From December 16 to 31, only one of the two-fish limit can be over 28 inches. 7) November through December, a Chesapeake Bay no-take slot limit of 28- to 34-inches with one fish of 34 inches or longer. 8) No Bay or coastal seasons and establish a 28-inch Chesapeake Bay size limit through November. In December, one of two fish could be over 28 inches. 9) One fish per vessel could be over 28 inches during the Chesapeake Bay season. The meeting begins at 6 p.m. at VMRC’s headquarters, Building 96, 380 Fenwick Road, Ft. Monroe, VA 23651. You can follow the discussion by attending the meeting or following up with the post-meeting report online by clicking here.